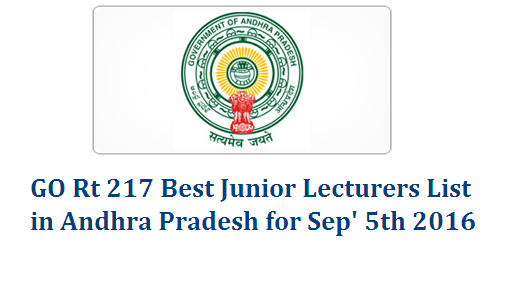 AP GO Rt 217 Best Junior Lecturers List in Andhra Pradesh GOVERNMENT OF ANDHRA PRADESH ABSTRACT Intermediate Education – Best State Teachers Award to Junior College Teachers for the year 2016 – Orders – Issued. SCHOOL EDUCATION (IE) DEPARTMENTG.O.RT.No. 217 Dated: 31-08-2016 From the CIE, AP, Amaravati, letter Rc.No.Acad.II-1/176/2016, dt.20-8-2016. The Commissioner of Intermediate Education, AP, Guntur in the reference cited has submitted the proposals for approval of the candidates selected and recommended by the scrutiny Committee for Best State Teachers Award to Junior College Teachers for the year 2016. The Commissioner of Intermediate Education, AP, Guntur is requested to take necessary action accordingly. Name of the Awardee Sarvasri/Smt.